Bioinformatics Center at Sri Venkateswara College was established in the year 2006 with an objective to promote Biology teaching through Bioinformatics, from the initial funding from the Department of Biotechnology (DBT) under the Biotechnology Information System (BTISnet) program. It is the first Bioinformatics Center established in the University of Delhi and North India for the benefit of training students at undergraduate level. 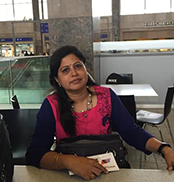 Dr. N. Latha is an Associate Professor in the Department of Biochemistry at Sri Venkateswara College, University of Delhi. She has over 26 years of undergraduate teaching experience. She did her PhD in the area of Bioinformatics & Computational Biology from IIT Delhi. She is also the Coordinator for the DBT-BTISnet funded Bioinformatics Infrastructure Facility (BIF) at Sri Venkateswara College since its inception in 2007. Her research work includes molecular modeling & simulation studies, computer aided drug design, network biology and immunoinformatics. She has been the Principal Investigator of several research projects in the college (funded by DBT, DU, DST) with over Rs.1.5 crores as the received grant. She has been awarded the International Project under the DST India -Belarus Science & Cooperation Fund. She has mentored several interdisciplinary undergraduate research projects. She has been instrumental in introducing a Certificate Program in Bioinformatics & Computational Biology for undergraduates in 2006. She has organized several training programmes, workshops conferences (10 National and 2 International) in the area of Bioinformatics, Genomics, Proteomics and Drug discovery for undergraduates/ postgraduate students, research scholars, college teachers and school teachers. She has several publications in journals of high repute. In recognition of this, the Bioinformatics Centre at Sri Venkateswara College has been awarded DBT-Incentive Award for highest number of publications in Bioinformatics in the years 2015, 2014 and 2013. She is a recognized PhD supervisor and has mentored PhDs and over 20 post graduate (M.Sc/M.Tech) dissertations from several University /institutes across the country. She has also coordinated the DBT-Bioinformatics National Certificate Examination (BINC) Examination of the Delhi Centre. She has been invited at many prestigious Conferences/Symposium in National & International platforms. She has been the Dy.Coordinator of DBT-Star College from 2011-2014. She has been Co-Coordinator of NAAC (2015-2016). She is the IQAC Coordinator (since 2016) and Nodal Officer, NIRF (2017). 1. Singh, S; Rajendran, V.; He, J.; Singh, A. K.; Achieng, A. O.; Vandana: Pant, A.; Nasamu, A. S.; Pandit, M.; Singh, J.; Quadri, A.; Gupta, N.; Ghosh, P. C.; Singh, B. K.; Latha, N.; Kempaiah, P.; Chandra, R.; Dunn, B. M.; Pandey, K. C.; Goldberg, D. E.; Singh, A. P.*; and Rathi, B. * (2018). Fast-acting small molecules targeting malarial aspartyl proteases, plasmepsins, inhibit malaria infection at multiple life stages. ACS Infectious Diseases (Accepted). 2. Avijit Podder, Mansi Pandit and Latha Narayanan (2018) Drug Target Prioritization for Alzheimer’s Disease Using Protein Interaction Network Analysis. OMICS: A Journal of Integrative Biology; 22(10):665-677. 1. Hemandra Kumar Tiwari; Prashant Kumar; Nidhi Jatana; Krishan Kumar; Sandeep Garg; N. Latha; Puran Singh Sijwali; Kailash C. Pandey; Nickolay Yu. Gorobets; Ben M. Dunn; Virinder S. Parmar; Brajendra Kumar Singh. (2017) In vitro anti-malarial evaluation of piperidine and piperazine-based chalcones: inhibition of falcipain-2 and plasmepsin II hemoglobinases activities from Plasmodium falciparum. ChemistrySelect. DOI: 10.1002/slct.201701162. 2. Avijit Podder, N. Latha (2017) Data on Overlapping Brain Disorders and Emerging Drug Targets in Human Dopamine Receptors Interactions Network. Data in Brief. http://doi.org/10.1016/j.dib.2017.04.001.